Aurum Alarms are experts in the field of electronic fire detection. We can carry out fire alarm installation, inspection, servicing and maintenance in the Wiltshire area including Salisbury and Amesbury. DOMESTIC MAINS INTERLINKED SMOKE DETECTORS - Detector and/or circuit installation, and replacement detectors. Did you know most domestic fire alarm detectors only have a ten year recommended life span? Check yours! it should have a date of expiry usually on the outer casing. FIRE ALARM INSPECTION AND SERVICE- For domestic or commercial customers we can perform an inspection of your FIRE ALARM to ensure its continued correct operation. For Business customers to ensure compliance with current legislation and standards we can inspect your FIRE ALARM annually or biannually. ALTERATIONS AND ADDITIONS TO YOUR FIRE ALARM SYSTEM- After a Fire Inspectors review of your premises it may be necessary to improve your level of fire detection, by installing additional components or replacing existing items. If you change your layout or use of the building the current FIRE ALARM SYSTEM may not be adequate. We can carry out the required changes. INSTALLATION OF NEW FIRE DETECTION AND FIRE ALARM SYSYEMS- All designed for compliance with current standards and ensuring you have the correct system for your property or business. Free confidential surveys and quotations are available. SURVEYS OF INSTALLED FIRE DETECTION SYSTEMS - We can liaise with your appointed ‘Responsible person’ and offer recommendation on your current system and help you to avoid any potential non –compliances issues. FIRE ALARM MONITORING - Consider the benefits of being made aware that your FIRE ALARM has been activated when you are not at your property, landline or GSM formats available. We can also often integrate fire detectors with your intruder alarm system if required. 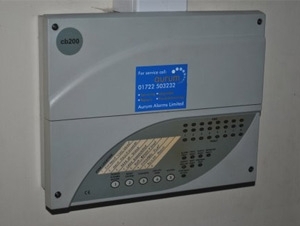 FIRE DETECTION SYSTEM CONSIDERATIONS, WHY USE THE EXPERTS AT AURUM ALARMS? This is a complex area, with a great deal of ever improving legislation that governs it. We have to consider all aspects of this including - The Regulatory Reform Fire Safety Order 2005. And all components of BS5839-1: 2013 . For buildings, BS5839-6: 2013. When designing a new installation we consider the category of fire detection system, such as P, P1, P2, L1, L2, L3, L4, L5, M. These categories examine the primary needs of life and property protection. 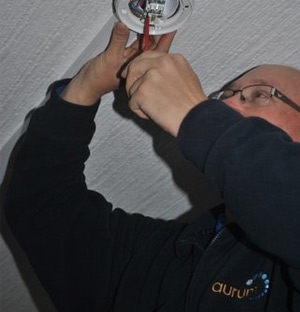 Aurum Alarms are a team of competent, experienced system designers, installers and maintainers of FIRE ALARM systems. We can provide you with what you require to keep you fully compliant and protected at an affordable cost. Call 01722 503232 for service.